It’s long been suspected that the actress willingly promotes CIA psy-op narratives in her films, but this time new leaks allege that Angelina Jolie had also at one time considered being the Pentagon’s “bait” to “catch Kony”, which draws into question the true motivation of other celebrities’ foreign policy forays such as Dennis Rodman’s “friendship” with Kim Jong-Un. Angelina Jolie is the poster woman for the “Hollywood-Intelligence Complex”, the perfect example of a willing CIA asset who regularly goes along with “deep state” narratives in her films, such as the anti-Serb production “In The Land Of Blood And Honey”. She’s also been one of the loudest global cheerleaders for “humanitarian interventions” abroad, or in other words, imperialist wars waged under distorted or outright fabricated “humanitarian” reasons such as the one that she had been lobbying for in Darfur. Jolie often visits US troops abroad like in Afghanistan, though up until now there were no grounds for suggesting that she was anything other than a propagandist, as it would have been ordinarily absurd to even countenance her playing an active role in the battlefield. 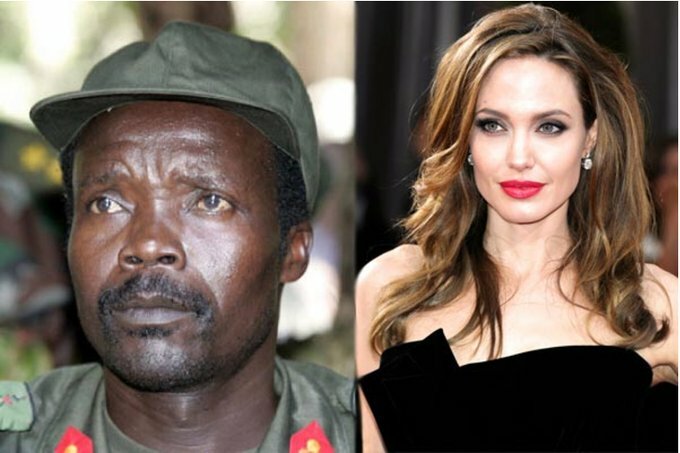 “A hoard of 40,000 ICC documents leaked to the French investigative website Mediapart reveals that Jolie once offered to act as human bait in a trap to arrest brutal Ugandan warlord Joseph Kony. She “has the idea to invite Kony to dinner and then arrest him,” reads an e-mail sent by former ICC Chief Prosecutor Luis Moreno Ocampo, reports The Sunday Times. According to The Sunday Times, which has seen the Mediapart documents, Moreno Ocampo hoped that Jolie and her now estranged husband would travel to the Central African Republic with a team of US Special Forces. If these allegations are true, then it would mean that Jolie had graduated from the usual propagandist class of Hollywood operatives to an in-field asset of the Pentagon in conspiring to carry out a globally important mission. Truth be told, “catching Kony”, as the viral 2012 slogan went, isn’t really that significant of a deal because the warlord is thought to have barely any supporters nowadays after years on the run in the transnational jungled space between his native Uganda, the Democratic Republic of the Congo, South Sudan, and the Central African Republic. In fact, the whole purpose of the CIA psy-op to “catch Kony” was to “justify” US special forces’ presence in this strategic region long enough for them to manufacture civil wars in South Sudan and the Central African Republic, which would turn them into a “failed state belt” that forever prevents their crucial incorporation into a Chinese-built bicoastal Silk Road through their resource-rich territories. The geopolitics of the Kony diversion aren’t the focus of this article, so it’s recommended that readers review some of the author’s hyperlinked analyses above if they’re interested in learning more about this Hybrid War campaign. Instead, it’s important to focus on the relationship between celebrities and the “deep state”, both in the propaganda and – as can now be seen – in-field operational manifestations. Thus far, it doesn’t seem like any of Jolie’s peers attempted to follow in her footsteps by partaking in such a high-profile covert mission, but toning down the drama just a notch and removing the lethal risk involved in her extreme example, it’s certainly possible that other “famous people” are doing something similar in serving their governments. The most relevant case that comes to mind is Dennis Rodman, who’s the US’ “Kim whisperer” in passing along messages through what he calls “basketball diplomacy” but who actually functions as the best American pair of eyes and ears that has ever gotten to known the reclusive North Korean leader in person. It’s been speculated for a few years already that Rodman might indeed be working for the CIA, but this was always dismissed by more mainstream voices who retort that he’s either “too stupid” or that “the CIA wouldn’t hire someone like that”, but these critics never take the time to consider that Rodman might be coerced into doing this in order to avoid a hushed-up drug bust or something of that nature. In any case, his last visit to the communist country was a failure because he wasn’t allowed to meet with Kim Jong-Un, although he did claim credit for jailed provocateur Otto Warmbier’s release shortly before his death. Given that the American student was going to die anyway from what was likely complications from his unsuccessful suicide attempt in trying to overdose on sleeping medicine, he probably would have been released whether Rodman came to the country or not, but it’s very telling that Kim Jong-Un refused to meet with his “best friend” during this time. Incidentally, it was shortly after this that the war of words and “insult diplomacy” between the North Korean and American leaders really took off, which might have been inspired by Trump finding out from his intelligence chiefs that they had lost their precious Rodman-Kim connection because Pyongyang could have figured out what the basketballer was really up to. Although it’s only speculation at this point, it would indeed explain why Trump made a show out of appearing to go crazy and resorting to the “madman theory” in dealing with Kim Jong-Un, as the US Intelligence Community might have concluded that this is the only realistic way left for directly communicating with his North Korean counterpart. 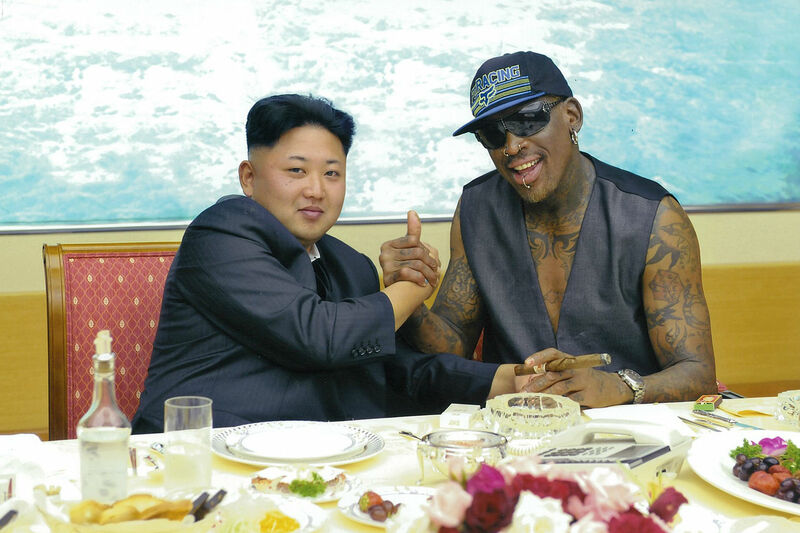 With Rodman’s last reconnaissance mission cut short and ultimately unsuccessful, the US might have feared that Kim was signaling to them that he was prepared to imminently flex his muscles in vengeful showmanship for having been deceived this long, and while it’s impossible to know exactly what he was in fact thinking, North Korea did end up staging several highly provocative missile launches this summer after Rodman’s visit and even carried out a nuclear test. The above narrative might sound dubious upon first read, but it certainly deserves to be reconsidered in light of the revelation that Angelina Jolie was working with the Pentagon as part of a highly secret special operation to “catch Kony”, which would in that case not make it sound so crazy to imagine that Dennis Rodman might have been doing similar field work for the CIA in collecting valuable personal intelligence about Kim Jong-Un. Even if the North Koreans are actually aware of what Rodman is up to nowadays, that doesn’t mean that he’ll never be allowed back into what some have derisively called the “Hermit Kingdom”, as there’s a certain value that could be derived from continuing to use him for informal diplomatic purposes and indirect communication with the US “deep state”. The ICC leaks alleging Angelina Jolie’s envisioned frontline role in leading a Pentagon special operations mission against African warlord Joseph Kony might be a shocking revelation for the casual media consumer unfamiliar with the intricate relationship between Hollywood and the “deep state”, but for others who are already aware of this network, then it’s just a long-overdue vindication of what they’ve known for some time. Jolie had always been suspected of being a CIA propagandist, though her new role in apparently wanting to function as the Pentagon’s “bait” is admittedly somewhat unexpected, though the revelation allows one to now reconsider the role of other celebrities in International Relations, particularly Dennis Rodman and his “friendship” with Kim Jong-Un. In light of the truth being revealed about Jolie, it’s now very plausible that Rodman is also a “deep state” agent too, albeit of a different caliber and deployed on a totally different mission. The emerging proof and reasonable speculation about celebrity-agents demonstrates that the “old days” of “celebrity diplomacy” are fading away, wherein “famous people” were once used to simply promote a country’s soft power, which includes giving foreigners passports to this end. Instead, the new trend appears to be instrumentalizing the high-level access that these individuals are privy to in order to achieve concrete strategic objectives, be it luring a warlord into an ambush or acquiring valuable personal information about a world leader who’s unfriendly to the US. All told, it should now be taken for granted that many Western celebrities are at the very least cooperating with US “deep state” infowar operations, but that the “best and the brightest” among them might have graduated to a completely new level of operational involvement in carrying out in-field activities in support of specific US foreign policy goals and therefore essentially behaving as deep-cover spies. This begs the question… what has Jolie really been up to in Cambodia? Angelina Jolie is a member of the Rockefeller CFR, along with Bill Clinton and George Soros. See lists in the CFR annual report.